It's not often that you'll see executives of multi-billion-dollar international companies speak frankly about unannounced products, but The Korea Times managed to get a few gems of information out of Samsung Executive Vice President of Mobile Lee Young-Hee. She confirmed that the Galaxy Note III will be unveiled at the upcoming September 4th "Unpacked" event (which is hardly a surprise), and also that the often-rumored Galaxy Gear smartwatch will be in attendance. Rumors about a Samsung smartwatch have been flying for the last few months, based on not much more than a few patents and trademark filings. Young-Hee's quote in the Korea Times is the first hard evidence that the device exists. She also confirmed the name and put the idea of a watch with a flexible display to rest, at least for the moment. We will be introducing a new wearable concept device called Galaxy Gear at our own event in Berlin on Sept. 4... The Gear won’t have a flexible display. The new device will enhance and enrich the current smart mobile experience in many ways. It will lead a new trend in smart mobile communications. We are confident that the Gear will add meaningful momentum to the mobile industry. Samsung would not be the first major manufacturer to announce a smartwatch: that distinction goes to Sony and its eponymous gadgets. And that's saying nothing of the Pebble smartwatch and its various imitators (or the decade of well-meant but ultimately failed watch/PDA/phone hybrids that came before). But as the current king of phone makers and the primary competition for Apple, Samsung has been getting a ridiculous amount of ink for the Galaxy Gear even before any truly tangible information has become available. A promotional image for the Samsung S9110, a watch-phone hybrid from 2009. The patents that have been widely reported as a basis for the Galaxy Gear feature Samsung's flexible display concept, so that would seem to rule them out for the first generation at least. 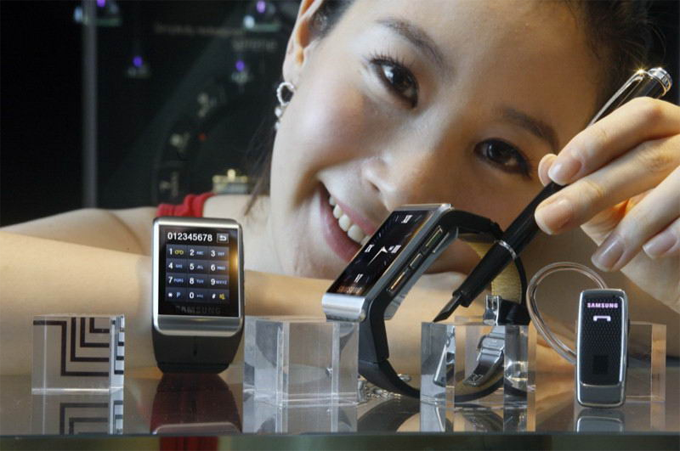 Young-Hee indicated that flexible displays might be implemented in future wearable products. Other questions about the Gear include what software it will run, what communications standards it will use, whether it will rely on a color screen or a more battery-friendly e-ink display, and, well, pretty much everything else. The executive also confirmed that the much-anticipated Galaxy Note III will be debuted at the Unpacked event, though she declined to give any details on hardware. 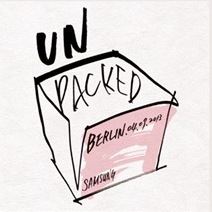 The Unpacked event is set for September 4th, two days before the IFA trade show in Berlin. The same venue was used for the original Galaxy Note and the Note II in 2011 and 2012, respectively.